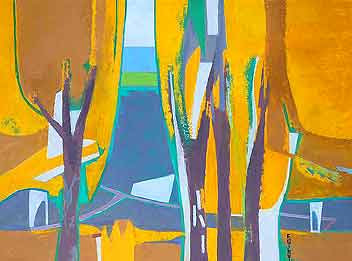 Manhattan real estate tycoon and President of Hirschfeld Properties, LLC, Elie Hirschfeld publically announced the acquisition of "Ginko Trees in Central Park" (2002-2004, Oil on Canvas), an original painting by Francoise Gilot. "'Ginko Trees in Central Park' holds great meaning to me because it depicts a special New York City scene and reminds me of the large ginkgo tree in the backyard of my parents' home," said Elie Hirschfeld. "I am honored to have purchased this painting and own a small part of such a great history. Ms. Gilot is an inspiration to all, both as an artist and as a person. Through this acquisition, it was a pleasure getting to know Ms. Gilot and I look forward to our ongoing friendship." Françoise Gilot (born 1921) is a French painter and bestselling author living in New York City and Paris. She is known for being the lover and artistic muse of Pablo Picasso from 1944 to 1953, and the mother of his children, Claude Picasso and Paloma Picasso. 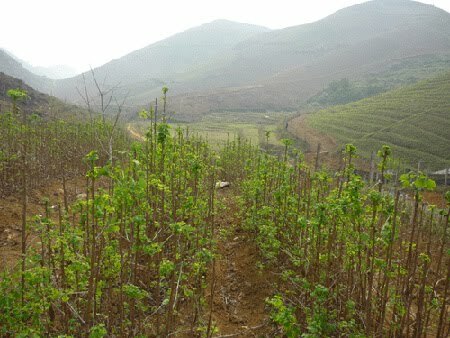 * New photo photospecial page: Spring: the pollen on the male Ginkgo tree are growing. * Added new video on my YouTube channel of seed germination. A video I made of Ginkgo biloba seed germination at the end of April 2010, about 8 weeks after putting the seed in moist sand. Seed is from an old Ginkgo tree at Maldegem (Belgium): Noordstraat 15, front garden of former house of Victor deLille. c. 1840, female, with chichi. Take a look at the videos I made of this tree. 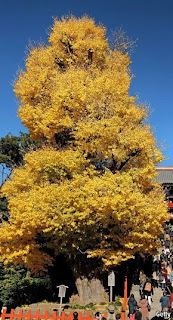 * Added to my Usage-page: photos Hachiman Ginkgo Japan. The Ginkgo will be the first Champion Tree in Germany. 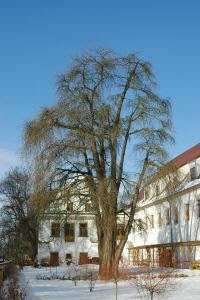 Champion Trees in Germany is a joint project of the Deutscher Dendrologischer Gesellschaft e.V. (DDG) and the Gesellschaft Deutsches Arboretum e.V. (GDA). "In Absprache mit der GDA beginnen wir mit dem Symbolbaum der DDG und „Baum des Milleniums“, dem Ginkgo (Ginkgo biloba). Im Garten des ehemaligen Rittergutes Dröschkau (Ortsteil von Belgern, Landkreis Nordsachsen; www.rittergut-droeschkau.de) steht ein Ginkgo mit einem Stammumfang von etwa 5,40 m, den wir ausgewählt haben. Mit Einverständnis und Unterstützung des Besitzers, Herrn G. Schumann (Torgau), werden wir uns am 25.04.2010, 11.00 Uhr, an diesem Baum treffen und ihn als „Besonderen und bemerkenswerten Ginkgo – Champion Tree in Deutschland“ würdigen. Vertreter aus der Region werden über die Geschichte des Rittergutes informieren und uns durch den benachbarten Park Treblitzsch (Standort der Omorika-Fichte, von deren Hexenbesen die Zwergform Picea omorika ’Treblitzsch’ stammt) führen.Interessenten sind herzlich eingeladen." The Ginkgo is the logo of DDG. 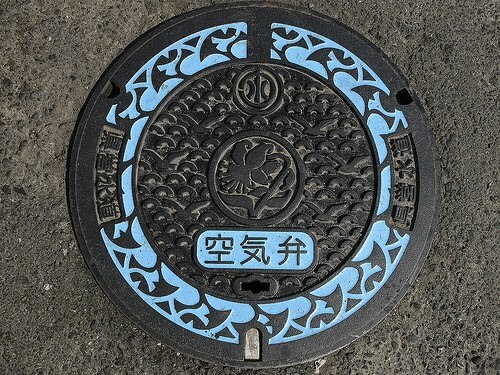 A manhole cover of Kanagawa prefecture (at Kamakura). A gull, a Ginkgo leaf, a gold-banded lily, which are the symbol of the prefecture, are drawn. This is one of the manhole covers photographed in Japan with Ginkgo leaves depicted on them (photo by risumiru). Plantation d'un Ginkgo biloba par le Lions Club: école Marbeau, France. A Ginkgo has been planted by Lions Club France at a school in Marbeau. Read more about the Ginkgo mission of the Lions Club on my blog here. Wedding Inspirasi blog: Lovely Ginkgo wedding dress by Lebanese designer Hanna Touma. It is Champagne gold and silver with Ginkgo motif. Bronze. 201 X 108 X 80 cm. This major exhibition of the surrealistic work of Claude and François-Xavier Lalanne can be seen at the Musée des Arts Décoratifs, Paris (France). More of Ginkgo-inspired furniture designs by Claude Lalanne can be seen on my website The Ginkgo Pages. 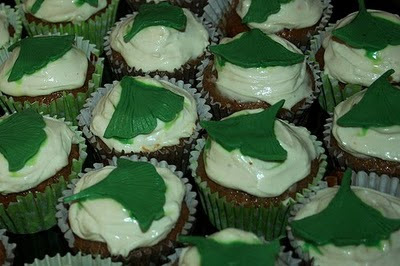 2010 is the South London Botanical Institute Centenary Year. The centenary celebration featured the new South London Botanical Institute logo, the Ginkgo. A large Ginkgo biloba tree grows in the SLBI front garden in London (UK) - the reason for the 'Ginkgo cakes'. Photo Jenny Neal on Flickr. 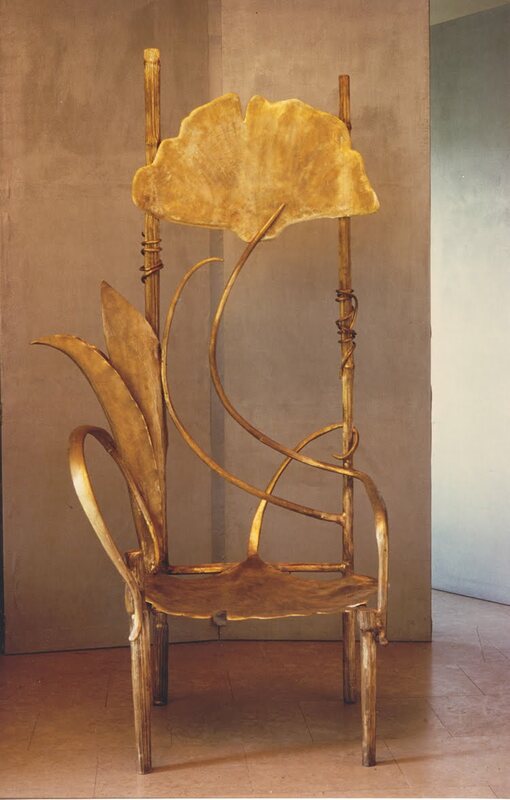 * Added to my Art-page (picture gallery): Ginkgo furniture designs by Claude Lalanne. Hachiman Ginkgo broke after 1000 years.
" Under orders from the prefectural government, scientists set about replanting the tree and cloning it. in Japan’s Shinto faith there are spiritual complications because this tree is, in essence, divine—it is, says Shigeho Yoshida, chief priest of the Tsurugaoka Hachiman shrine where the Ginkgo stood, “a holy tree”. In the Shinto faith, he patiently explains, nature is to gods and man what God is to nature and man in Western religions. So when scientists say they are cloning the tree’s gene, he believes they are really propagating a holy spirit. That is a sacred task. Only when he was assured that this was natural science, not the laboratory sort, did he feel comfortable enough to give his blessing. But it is still a touchy issue. The Kanagawa prefecture has not only sought to revive the tree in the shrine’s grounds. It wants to plant offshoots elsewhere, possibly as a tourist attraction. Mr Yoshida is a bit scandalised. What’s more, he felt the old Ginkgo may have been trying to send a message by tumbling down. “So many people came, called and sent e-mails offering their condolences. Perhaps the tree fell to draw everyone’s attention away from their focus on materialism and money.” For all the materialism, trees are still touchingly revered in Japan. It is cherry-blossom season, a time of all-night sake-drinking parties under the sakura. Even salarymen take photos of the blossom to send to their girlfriends by mobile phone. But the Ginkgo is special. The story goes that in the 13th century, an assassin hid behind it before severing the head of his uncle, the last shogun of the Minamoto line. Centuries of bloodshed followed. Mr Yoshida says the tree’s demise has drawn 20,000 people to the shrine. He hopes more will come if it revives. With all the press coverage, that could give Japan, a year hence, a taste of its own Easter story. Just don’t mention the word “resurrection”, which is part of neither Shintoism, nor Buddhism, the country’s other religion. Mr Yoshida can barely bring himself even to whisper the word." Citations: article in The Economist - March 31st 2010. * New photo photospecial page: Ginkgo in private evolution garden with tree fern and cycad, Brazil. * Added photo of Ginkgo bonsai in Xi'an, China.